When weaving dense fabrics, it can happen that the selvedges of the fabric are looser than the rest of the fabric. Due to the wavy fabric selvedges, such fabrics can be further processed only with difficulty, because the selvedges cannot be kept at the same tension as the rest of the fabric. This is referred to as wavy selvedges. This waviness has a negative effect especially during unwinding or rewinding of the fabric. The wider the fabrics are produced, the more distinctive the waviness becomes. Often dense fabrics are coated in a second stage. Also during this coating wavy selvedges have a negative effect. Because of the loose selvedges a uniform coating of the fabrics is hardly possible. 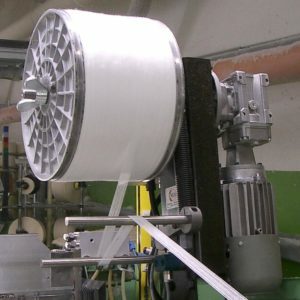 These disadvantages can at least be minimized by feeding the selvedge yarn from warp bobbins to the weaving machine, which allows the yarn tension to be set accordingly. Our selvedge let-off guarantees a constant warp tension from full to empty warp bobbin. The devices can be equipped with a tension indicator to ensure the reproducibility of the tension settings. A further improvement can possibly be achieved when weaving from several warp bobbins by using different warp tensions. It is a small device for the measurment and display of process tension. The digital unit is zeroed and calibrated. For natural and man-made fibers. For natural and man-made selvedge thread yarns, as well as for tapes on warp bobbins. The warping machine is equipped with the latest control and operating technology.